Remote cabin on ten acres, plenty of room for outdoor activities, gatherings, nature is abundant, deer, turkey can be seen. Two bedrooms, one bath, spacious living room with reclining sofas, large TV, fooseball table, kitchen complete with smooth top range, refrigerator, microwave, coffee maker and toaster. Plenty of room for 2 trucks and boats, four wheelers, tent camping, motorcycles, outdoor fun. . 1 mile from the Jonathan Creek bridge on beautiful Kentucky Lake, minutes from Land Between the Lakes, Wranglers Camp for horseback riding, hiking, Turkey Bay for four wheeling, something for everyone. The property is close enough to the main road for easy access, but remote enough to feel one with nature. 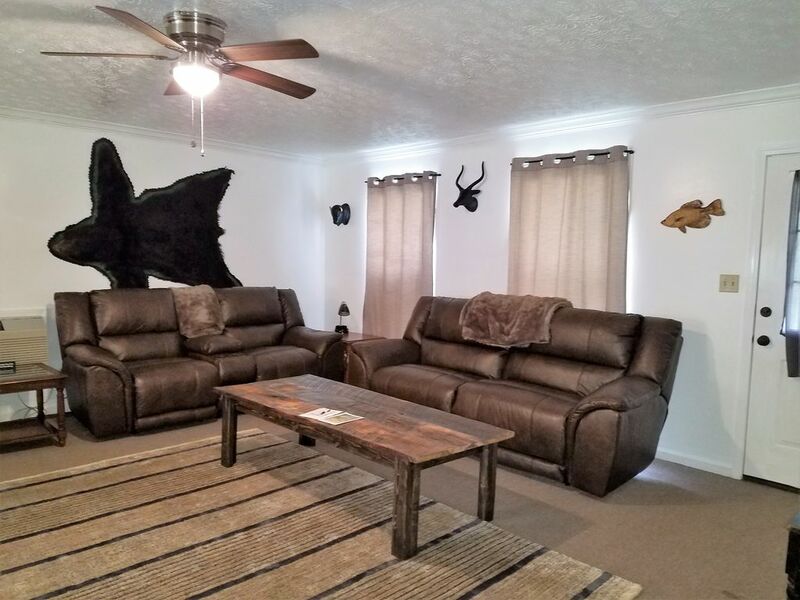 The driveway has easy access with plenty of turning room to accommodate truck with boats or trailers for fishermen, bikers and four wheeler enthusiasts who want to enjoy our beautiful KY Lake area. We are outside of town and close to Illinois, Tennessee and Missouri for day time adventures. We strive to make our place comfortable and welcoming. Just a mile from the Jonathan Creek bridge, convenient for boaters, close to LBL for sight seeing, 4 wheeling, horseback riding or just cruising the area. Private yet close to restaurants and gas stations. Inside of property was nice, outside- not so much. The property was very nice and even more pleasing than what was advertised. I think it was very cozy and had everything advertised and that we could need. The location was very central to everything we had an interest in doing and we would definitely come back here. We appreciated the effort that was gone through to make the place comfortable and provide everything we needed for our trip to not be hectic and be relaxing. The place is very nice and clean. Very comfortable, roomy and quiet. Had everything that we were looking for. Definitely, will stay here again. The owners, Linda and Todd could not be nicer!